Stoelting’s Shake Freezers feature a compact design with high-capacity output. These units will handle high-demand rush hour requirements quietly and efficiently making them ideal for high volume commercial operations such as fast food locations, drive-ins, theme parks, institutions, and recreational facilities. 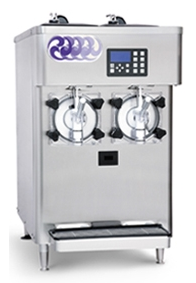 With its unique auger that delivers smooth creamy shakes and optional spinners for multiple flavor blending Stoelting’s Shake Freezers are perfect for thin or thick milkshakes, frozen beverages, smoothies and frozen cocktails.